Songkran is a festival held every year in Thailand on April 13. This is Thailand's New Year's party. It celebrates the traditional New Year in the Thai calendar. The festival lasts all over the country for 3 days. However, in the northern city of Chiang Mai, it is six days. Long ago, Thai people used a different calendar from other places in the world. Their year started around April 13. Now, their year starts on January 1, but they still celebrate the New Year from April 13 to April 15. People celebrate Songkran by throwing water at each other in the streets. It is exciting. It is also known as the Water Festival. Almost everyone gets wet, even the police. People put water on old people's hands. The only people who do not get wet are monks and babies. People throw water for many reasons. The most important one is to have a clean body and mind for the New Year. In Thailand, it is very hot at that time of year. So, people do not get angry when they get wet. People believe that water will wash away bad luck. It is also a time to visit family and give gifts. People go to the temple to pray and give food to monks. They also clean the Buddha images in temples with water and perfumes. In Thailand, most people are Buddhist, so they keep statues of Buddha. On April 14, people dance and sing in the streets. They also carry their statues. They throw water at the Buddha statues to clean them. The water smells nice because it has flowers in it. The streets smell good during Songkran. Sometimes there is a contest to choose the most beautiful woman. And the legend of the important ladies on Songkran Day is Nang Songkran. The seven daughters of Kabil Maha Phrom. They have their own names, but most of people called them as Nang Songkran or the Songkran Ladies and they ride on the animals. She stands on the animal’s back if she comes in the morning rides on its back if she comes in the afternoon. For instance, in the year 1951, the Songkran Lady named Kimitha appeared on the 13th April at 1 o'clock 17 minutes and 56 seconds in the morning. She reclined with her eyes closed on the back of a buffalo. The time she appears is when the sun first enters the sign of Aries which heralds the beginning of Songkran New Year's Day..
Another thing people do at this time is they clean their houses. They also wear new clothes. All these things show that people are ready for the New Year. 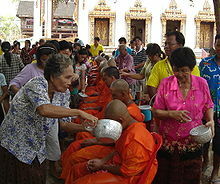 Wikimedia Commons has media related to Songkran. This page was last changed on 29 September 2017, at 13:56.